Whether your pet is a companion or a performer, PMI Nutrition Exclusive pet food is dedicated to building products that optimize your pet’s purpose in life. PMI Nutrition Exclusive pet food is only available from knowledgeable retailers like Mansfield Feed Mill, so you get the information, education and support you need with every purchase. 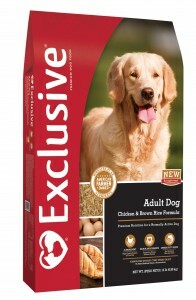 Exclusive is here for you and here for your pet – every step of the way. PMI Nutrition Exclusive always using real chicken or savory, natural lamb in our formulas, with complementary high-grade, natural ingredients with vitamins and minerals – at a fair price. 100% Satisfaction Guarantee All PMI Nutrition Exclusive pet foods carry our 100% Satisfaction Guarantee. If you are not completely satisfied with this product, please return the unused portion to the store of purchase for a full refund or replacement. PMI Nutrition Exclusive is currently offering Buy 8 Bags, Get 1 Free! Come by Mansfield Feed Mill to get your bag today. This entry was posted on Wednesday, March 16th, 2016 at 10:01 am	and is filed under Dog, News & Updates. You can follow any responses to this entry through the RSS 2.0 feed. Both comments and pings are currently closed.